Ballet Arizona dancers in “Symphony in Three Movements.” Choreography by George Balanchine. Photo by Alexander Iziliaev. Igor Stravinsky originally composed the music used in Symphony in Three Movements for three different films, all of which were composed at different times. In the end however, they were never actually used on screen. The music expressed Stravinsky’s impressions of World War II but he denied that the composition was programmatic in any way – a sentiment shared by Balanchine. La Sonnambula premiered in 1946 for Ballet Russe de Monte Carlo in New York City under the original title Night Shadow. Natalie Magnicaballi as “The Sleepwalker” in George Balanchine’s “La Sonnambula.” Choreography by George Balanchine. Photo by Rosalie O’Connor. Prodigal Son premiered on May 21, 1929 in Paris and was one of the first of Balanchine’s ballets to achieve an international reputation. Sergei Prokofiev, who conducted the premiere of Prodigal Son, was upset by Balanchine’s concept of the Siren. He thought the Siren should be demure, a radical difference to Balanchine’s choreography. 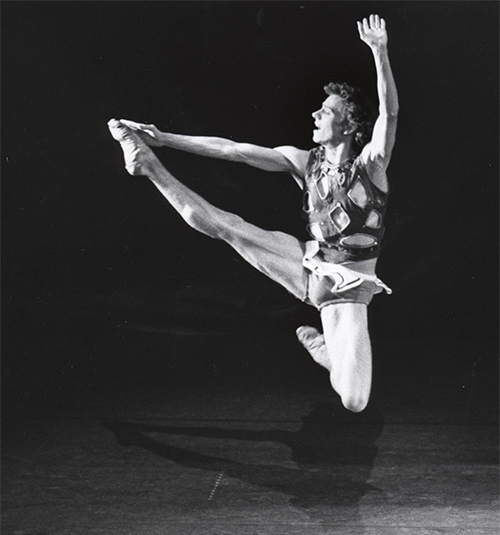 Artistic Director, Ib Andersen, made his Prodigal Son debut in 1986 and was said to be “especially eloquent” in the title role. Ib Andersen in the title role of George Balanchine’s “Prodigal Son.” Choreography by George Balanchine. Click here to check out Ballet Arizona’s production of All Balanchine May 3rd – 6th at Symphony Hall.